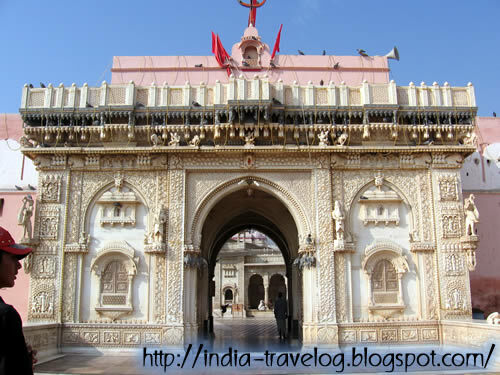 The supreme attraction of the quaint little town, Deshnoke, is undoubtedly the temple of Karni Mata. Infact there is nothing much to see here other than this unique temple which draws visitors from everywhere. People come here from all over Rajasthan and as far as Gujarat, Madhya Pradesh and Haryana to pay their tributes to Shri Karni Mata. The lovely temple of Karni Mata is looked after by the “Charans” who are said to be the heirs of Karni Mata. 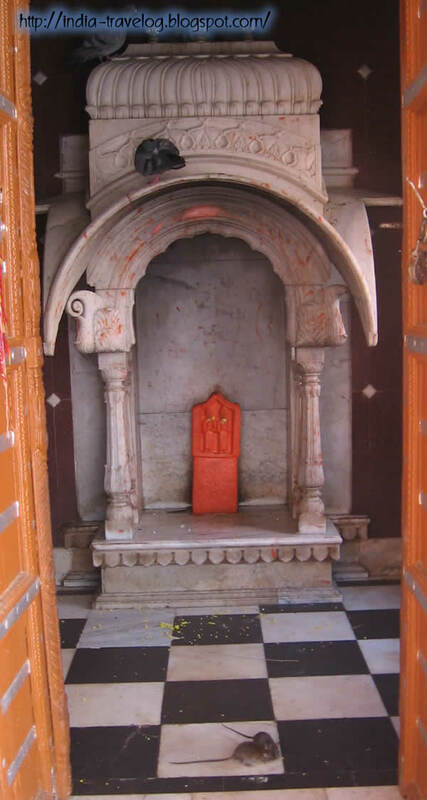 Karni Mata, born to an ordinary couple – Meha Ji and Dewal Bai, was married to Depaji in the year 1401. Karni considered an incarnation of Goddess Durga asked her husband to marry her younger sister, Gulab Bai, to produce an heir. Depaji and Gulab Bai had four sons – Naga, Puna, Shitha and Lakhan. Story goes that Lakhan drowned in a pond while swimming and Karni asked Yama to bring him back to life. However, as his soul had already left his body, Yama brought him back to life as a rat. 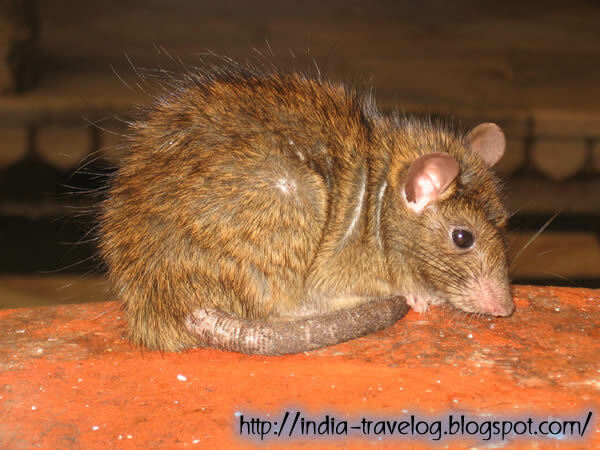 Since then all descendants of Karni are born as rats after leaving their human bodies. 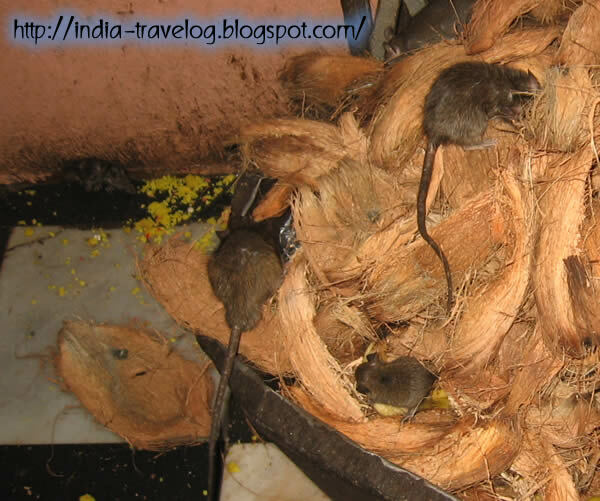 These rats then are reborn as Charans. And, the cycle continues. 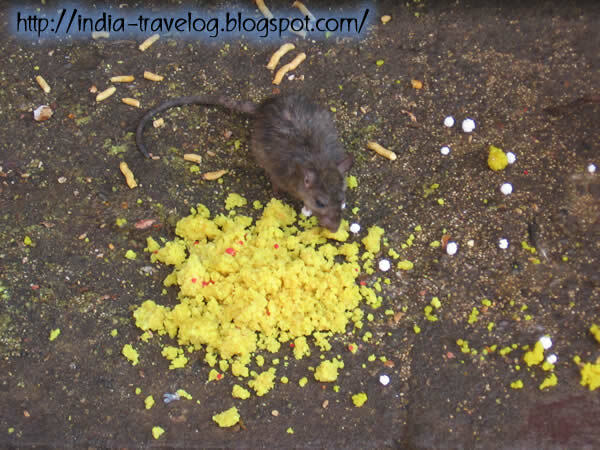 That is the reason why the rats in the temple are so revered. 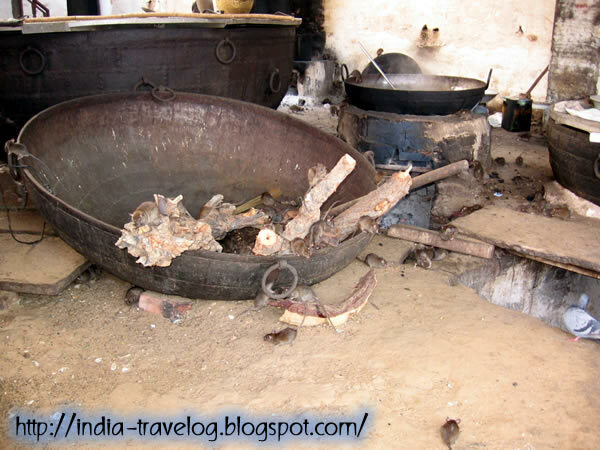 If you step of and injure or kill a rat, you need to provide a silver replica of the rat to nullify the sin you have committed. 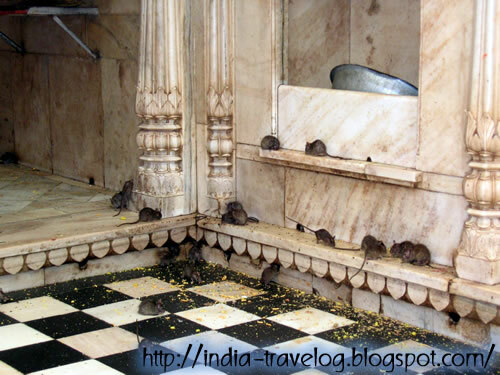 The temple is teeming with rats – big and small, young and old, grey ones and the occasional white ones. 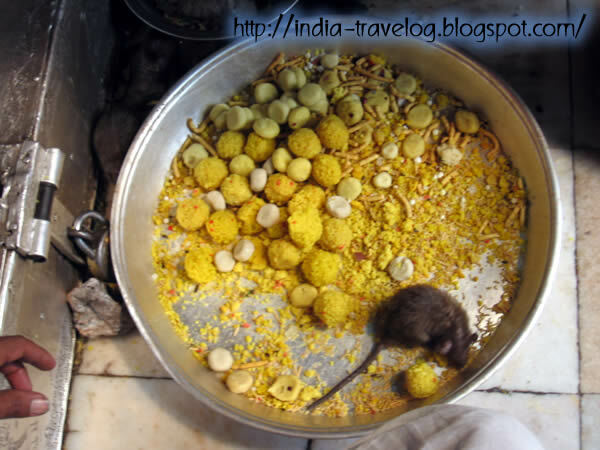 Spotting a white rat in this temple is said to bring good luck. At first glance, you may not see many rats. However, look closely and you will find then hiding in the specially created built-in holes on all the walls. There - you can spot a tail hanging out from one of these openings….and look here – two eyes peeping out at you from a dark corner. Inside the temple compound there is a locked up area with bare earth floor. Broken flagstones and giant overturned bowls dot the place. These look like the stuff used in the temple ages ago. A very nice hiding place for the rats. 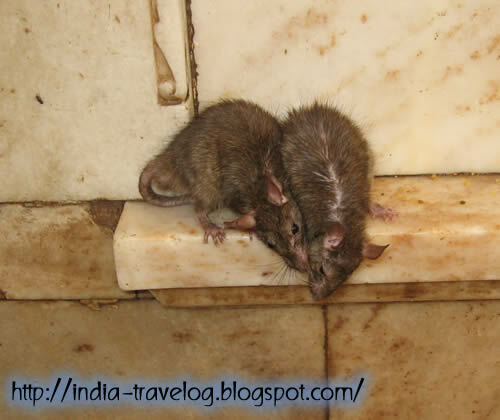 The sanctum of Karni Mata has many paintings of Karni Mata and rats adorning the walls. 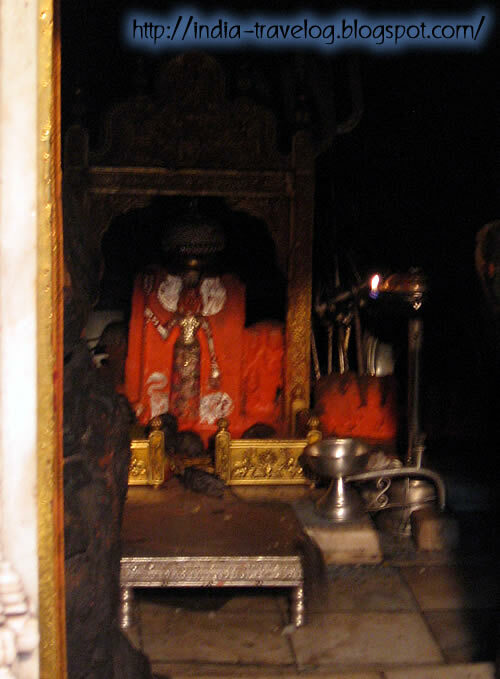 Devotees are not allowed into the inner shrine, which houses the statue of Karni Mata. 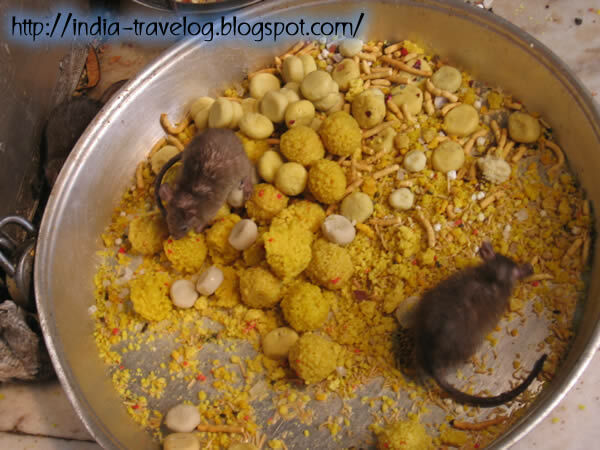 The rats are offered milk, coconut, fruits, grain, laddoos, peda and other sweets. 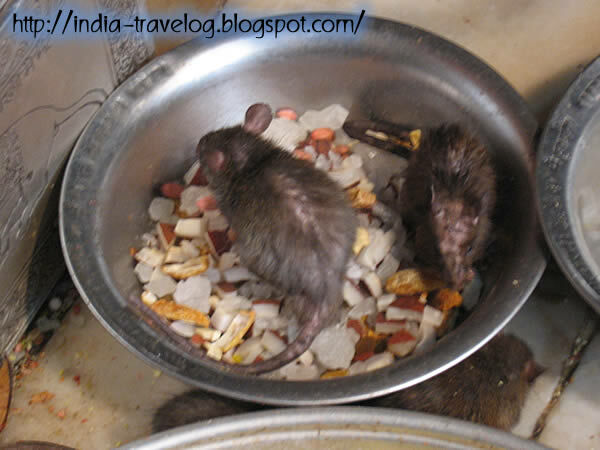 There are many huge bowls filled with milk and water placed strategically for the rats. 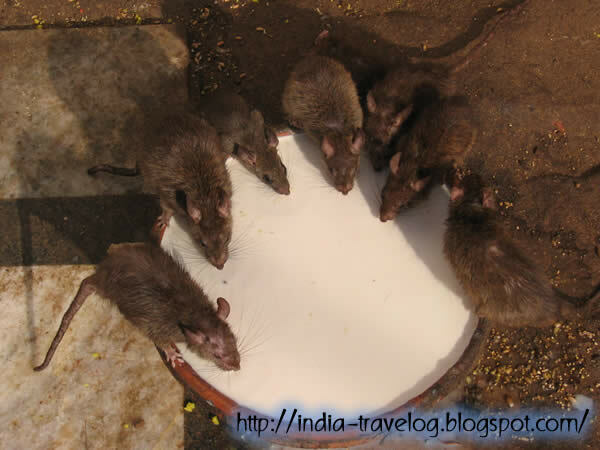 At any given point of time, you can see a group of rats drinking their fill. The rats are not scared of humans and come quite close. They even nibble on food placed on your palm. 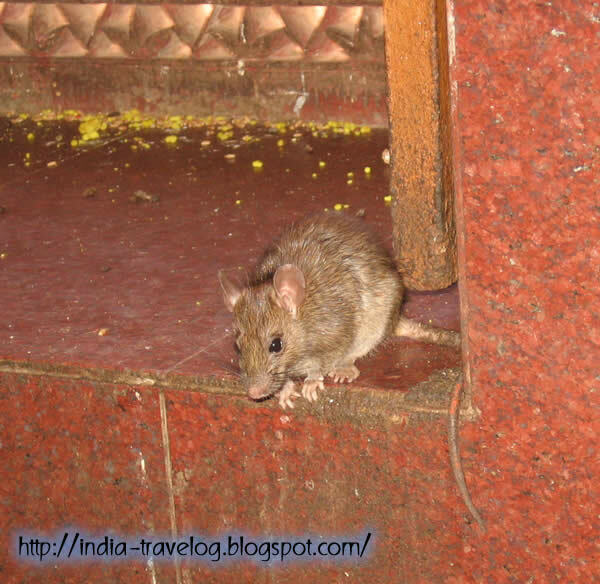 You can see them scampering around your feet as you enter the temple premises. You need to be alert and very careful lest you trample on one of these. There is also a Karni Museum located right opposite the temple. 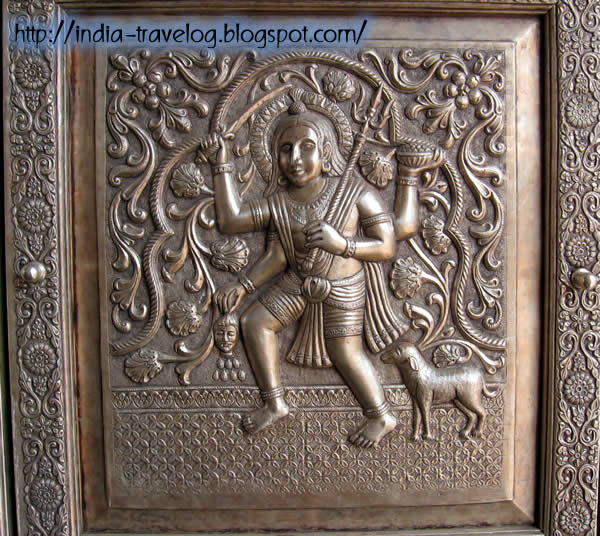 It houses lovely paintings depicting Karni Mata and her life. The museum is open to all daily.